Team Fortress 2 isn't just a for shooting spies and torching scouts, it also lets Valve try things it couldn't do anywhere else. Valve co-founder and managing director Gabe Newell says that class-based, multiplayer shooter Team Fortress 2 is a great place for the developer to experiment and try out new ideas, without upsetting fans. Newell said that because TF2 was a more stylized game than the likes of Half-Life or Left 4 Dead, it was possible to do all kinds of crazy stuff without "destroying" it. 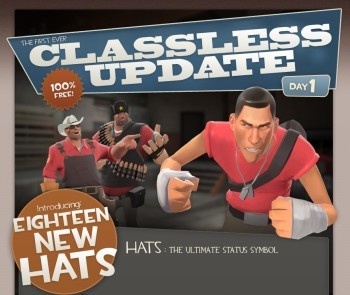 He used the example of the funny hats that Valve has added to the game, saying that it would have been nearly impossible to try that on something like Counter- Strike, but that it was something that TF2 could easily absorb. Newell says that Team Fortress 2 isn't the only place that Valve tries out new ideas, adding that every game presents opportunities to try different things, but he admits that the range of interesting ideas is a lot more limited with more realistic games. "[E]ach time we look at it, [we ask] 'What are the things we evaluate?'" he said. "'What are the things we want to learn from this? What are the things we want to try out? And what are the safe things that we can try out that won't screw our customers?'" It's fascinating to think that the additions to Team Fortress 2 aren't just about making that game better, but about making all of Valve's games better. Kind of makes you wonder exactly what it's learning from us.